The Men's Short Sleeve Button Shirt. This shirt is stylish and comfortable. 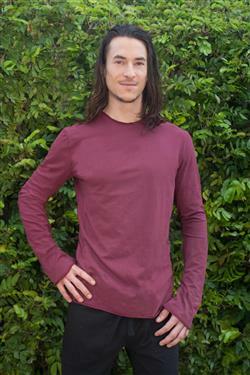 This shirt is available in the 53% hemp/ 44% organic cotton/ 3% stretch jersey blend. 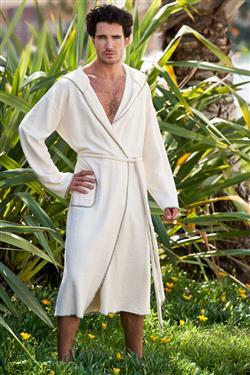 See under Spa section to order the brown fleece fabric which is pictured here. 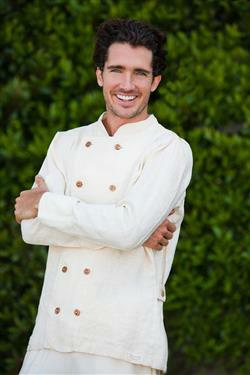 This is the Chef's Jacket for both Men and Women made from 100 % hemp natural fibers. A favorite amongst our chef's though out the world. The wooden double breasted buttons add a nice smooth fit and detailing. 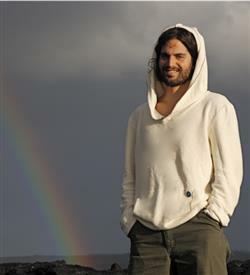 The hemp fabric will soften up every time you wash and wear. The Men's Hoody is a great stable. Stylish and comfortable. A generous hood and thumbholes are the Aum details. 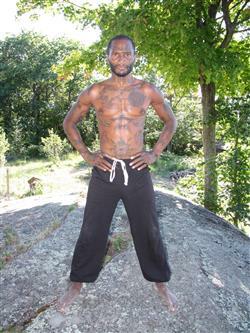 The fabric is a 53% hemp / 44% organic cotton / 3% stretch. Shown here in the creme colour. 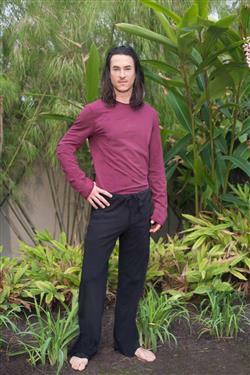 Genesis Sunfire models the Aum gym pants in black colour, 53 % hemp / 44 % organic cotton / 3 % spandex... ahhhh so comfortable and durable... hemp is the most natural durable fibre available. 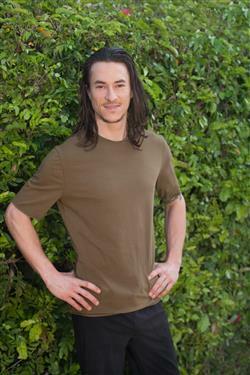 Every man's dream, an organic short sleeve tee shirt, a piece you will never want to take off! Cool and comfy, breathable and stylish. Pictured here is the green colour, 53 % hemp / 44% organic cotton / 3 % spandex.